So Lily got two letters today. The first was rather a waste of nice paper. Thank you Chris. Maybe Lily should write a few more letters. This entry was posted in Food, Giraffe Bread, Lily. Bookmark the permalink. Hi. Lovely letter. Would you object to me featuring it on Letters of Note at some point? Thanks! thank you for asking; of course you can! This really is just wonderful. It’s amazing that we have this capacity to reach out and connect with one another with the smallest of gestures. Chris King did a great thing when he stopped and listened. He responded. And kindly. That’s human nature at it’s best. Of course all of these would not have began without your wonderful little girl. Lily sounds like a beautifully inquisitive child, you must be incredibly proud of her. I hope she always asks questions & and hopefully receives more answers like these. Loved this – made my day! And a flipping good question too Lily. However, do you realise that your postcode is showing in the waste of paper’ letter? You may want to blur it out, considering how much Twitter attention you’re getting! 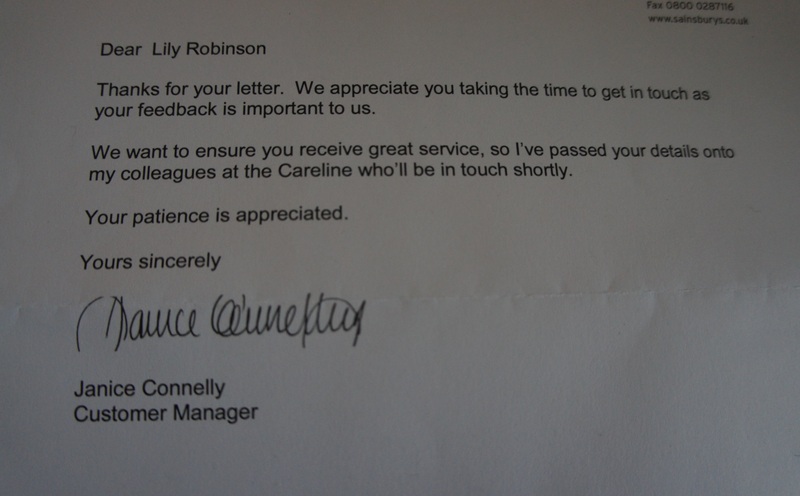 Little Lily with her adorable letter and Sainsbury’s reply got viral. Real viral. Pingback: How the Sainsbury’s Customer Service Letter went viral; my theory | blog till you drop! WOW! An amazing story – certainly grabbed the addition on our facebook page. Reblogged this on Joseph Shambrook. I just bought some today! (plus I e-mailed Sainsbury’s to say I’m with Lily and think they should make the name change permanent). hahahah 🙂 I love it! The best part is that the manager put his age at the end!!! 🙂 also, how random is a £3 gift card 🙂 SO cute though! So sweet. And, Chris King, aged 27 and three quarters now, thumbs up to you! 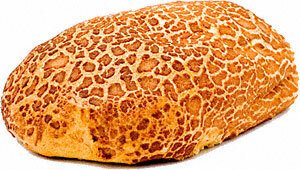 I’ve just read that Sainsbury’s are renaming it giraffe bread! How fantastic! I’ve often thought it was badly named. Well done Lily! 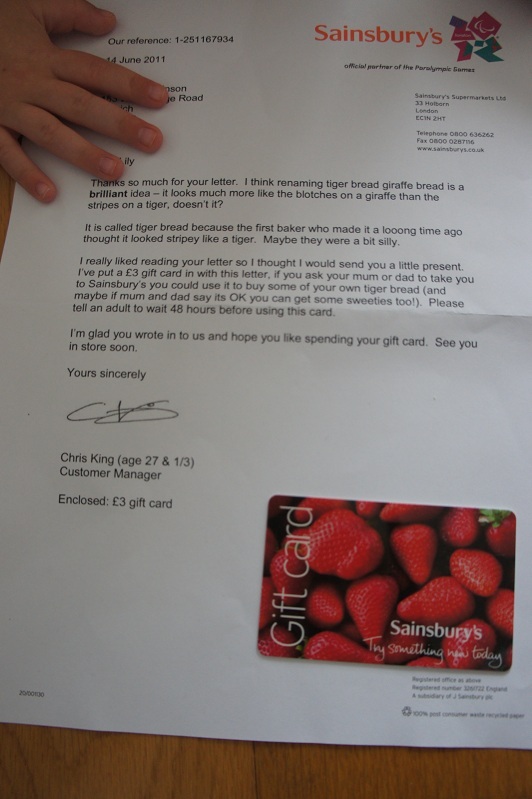 I hope my child writes similar letters to big corporate retailers in a few years time! Excellent! Well done Lilly! It’s nice to hear of story’s like this now and then. It’s amazing how even large corporate leaders have a sense of humour and are willing to change. Great story! A great example of customer care done well! This link is superb – my kind of learning 🙂 thank you very much. I will show Lily when she wakes up. Pingback: Lily e a girafa « Ai, Carmen! Several sources are indicating that I started the facebook campaign, which I did not. There are several pages set up to encourage the change of name, and the person who sent the images is unknown to me. I think The Telegraph made the mistake first and have been quoted widely elsewhere! Pingback: Brand banter – Customer Service and consumer/brand interaction at its best. | we are carrot. Pingback: What this store did to their customer’s enquiry was absolute genius! A lesson in customer experience for everyone!